Since the early 1990s, the Reality of Aid Network (RoA), a Southern-led North/South network on reforming aid policies and practices, publishes a major global report assessing development cooperation for poverty reduction with an emphasis on qualitative analysis of the national and multilateral aid regime. The RoA Reports analyse and advocate key messages relating to the performance of aid donors from a unique perspective of civil society in both donor and recipient countries. These Reports have developed a reputation as an important independent comparative reference for accountability and public awareness of development cooperation issues. 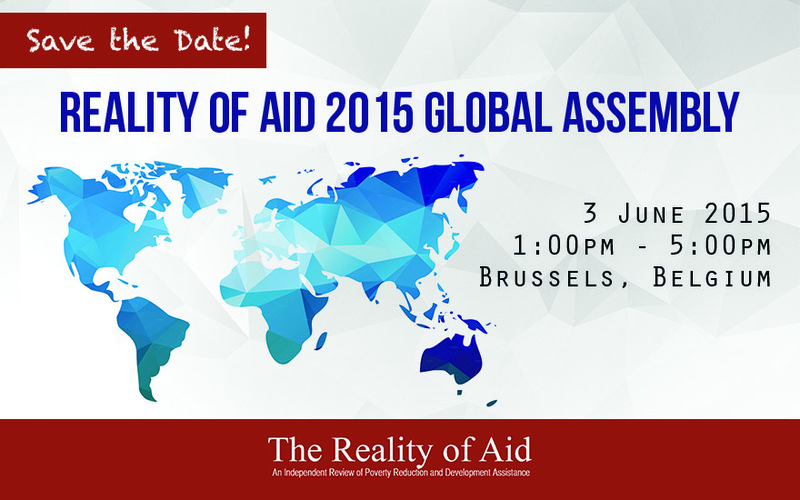 The RoA 2015 Global Assembly will engage CSOs and other development actors in a discussion of potential themes of the next RoA Report and to share national and regional experiences as it seeks an exchange on what trends, practices or areas need the attention of civil society and build ownership around common key messages. The workshop’s premise is that the international development community needs to recalibrate development cooperation policy and practice to fit a new post-2015 sustainable development framework in order to significantly address the changing face of poverty and inequality in the world today. In its 2014 Report, RoA urged development actors to take stock of various forms of partnerships and look at ways of ensuring equitable partnerships towards achieving the post-2015 goals. In the current milieu there are many types and forms of development cooperation (financial/in-kind transfer, technical cooperation, etc.) that donors, South-South Cooperation actors, partner country governments, non-state actors like CSOs undertake which can benefit from scrutiny. There are also substantial debates among CSOs on broader development cooperation policy, aid architecture and global development finance that merit looking into. As a network, RoA’s focus has always been on maximizing contributions to poverty eradication, within a framework that is defined by human rights standards. Expected discussions in this workshop are relevant to all development actors in their own contexts. Moreover, as Europe is home to many bilateral donors, analyses of their policies and practices will be of interest not just to those directly engaged in development cooperation, but also to the tax-paying public. What trends, practices or areas of development cooperation need the attention of civil society? How can civil society contribute to making development cooperation more focused on reducing poverty and inequality in a post-2015 world? How can development policies and practices involve the poor more effectively in the management and monitoring of development cooperation programs? As the outcomes of this workshop will form the foundation of RoA's next global report, the key themes that will emerge from discussions will be developed into a Theme Statement that guides the production of the report (from topic selection, write-up of contributions, editorial support, to publication and dissemination).